Last updated 05 March 2019 . By Georgia Evans. The Gobpsy is an all-new top secret haunt on Fenchurch Street hidden underneath a barber's shop. Guests will only be able to find the secret bar through a discreet towel shelf at the bottom of a staircase. Push this, and you’ll find the mysterious hideaway boasting low-lighting, glamorous furnishings and a touch of 1920’s style through its teal velvet seating and gold accents. The menu features suitably quirky cocktails served in kooky containers. One example being the Amazonas, which is served in a blue ceramic jar with a sloth hanging off it. Created with rum, Amaro Montenegro, banana puree, orange bitters, passionberry and pineapple powder, it all comes together to make a tropical refresher. 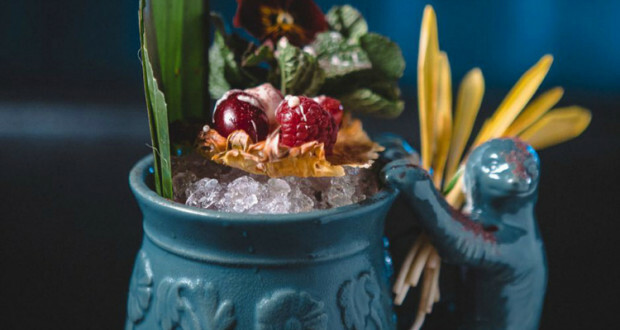 Another unique creation is the Sweet Skull, made with sweet yet punchy ingredients such as tequila, cointreau blood orange, smoked paprika and tamarillo, passionberry and bamboo charcoal. This is then served in a skull cup to bring an extra touch of spookiness to your Insta-feeds.